New concepts concerning how a red giant forms and what occurs within the core to maintain this stellar class. The mankind's definition of the stellar phase of a Red Giant during the fusion life cycle of a cosmic stellar object may be at or near the end of a star’s existence. As the primary fuel within the core supporting the fusion process nears exhaustion, helium and other light elements in sporadic pockets increase in their proportion to support the fusion process. What truly goes on within the core is that hydrogen overwhelms all fuel sources by shear volume and other elements are always part of the fusion process, but do not become a significant until the ash buildup near the core (heavier light elements) are circulated within the fusion compression zone of a star. The ash buildup allows the core temperatures decline, initiating compression of this central area as the solar mass leaches heat into nearby space. The original core now under an intense new compression due to gravity from consolidation of the original solar mass, transmutes helium and other light elements into a new hyper fusion process. Many theories contemplate the progression of events that occurs in a star, but does current consensus presented by modern science follow the exact sequence of events? The stellar evolution presented by mankind only presents a small picture of events in the universe. Yes some events follow a progression of phase change, but the majority of stellar objects are created in their present form, and follow a process of dying that mankind assumes as the last phase of all stellar formations. There are some new foundation models defining specific areas of stellar development that need to be addressed. Available fuel ratio: This is defined as the total stellar mass in relation to light elements available for the fusion process within the core compression zone on a real time basis. This determines the average life of the star. Distribution of Dampeners to Light Elements: The distribution and makeup of heavy elements and their concentration within in the core determine several factors the rate of the fusion process, overall compression due to mass, and containment, viscosity, heat retention, reflectivity of heat subatomic particle flow back towards the core, and retardation of normal particle flow within the core i.e. repulsion, gravity and magnetic to name a popular few. This is the primary determinant of mankind's stellar class. Core Compression @ the Point of Fusion: Based upon heavy elements gathered within the core and average amount of hydrogen mass contained in a cc and percentage of the radii in the zone at the point of fusion, as opposed to the current consensus of a core primarily based around hydrogen and helium. Churn of the Stellar Core: the churn allows hydrogen and other light elements on the fringe of the compression zone to become part of the fusion process. In rare situation where a high rate of churn moves a large amount of light elements available for fusion into a new highly compressed zone the energy burst produces enough force to overcome the gravitational containment of the entire solar mass, thus a super nova. Total Mass Ratio of the Stellar Object to Volume: Currently explained by science by the explanation of giants, stars similar to the Sun to dwarfs and neutron stars. Heat Reflection Factor of the Corona: Acts upon the solar mass in reverse where low reflectivity initiates compression of the solar mass due an increase loss of heat sub atomic particles. In opposition high reflectivity or stellar heat sub atomic particle bounce back increases molecular stellar activity at the shell thus expanding the solar surface area. Efficiency of Heat Dispersion to Total Surface Area of the Star: This is reliant upon the total of heavy element propelled towards the surface and percentage ratio mass to light elements within the outer 10% of the total solar mass. This is a dependant factor of stellar brilliance. Total Ambient Containment due to the Repulsion Force of Nearby Objects: This becomes a factor in a small degree with large and massive planetary systems within the orbital sphere and to greater degree in multi-stellar systems. Density of the Universal Plane Based on Dark Matter Mass per a Defined Reference Cubic Area of Space : Determines vibrational rate of the atom and matter at the subatomic and nuclear level. In a red giant there are fewer heavy dampening elements dispersed throughout the core from inception, the localized big bang. Core compression around a rocky heavy element core is aided by gravity as the initial stellar mass has gathered a lion's share of the available mass within the area before the repulsion force tends to cut growth and separate new stellar objects. The first changes occur during the expansion phase, the heavy lighter elements tend to burn off quickly in terms of standard relationship of helium plus other elements in proportion to the base of hydrogen. This affects stellar longevity, but not does not impede the fusion reaction where collapse of the core occurs due loss of available fuel and heavy element ash buildup. Second, the low mass of the core in relation to the total stellar mass allows an expansion of the gaseous cloud that supports the surface and corona of a stellar object to expand as the flow of incoming gravity particles are reduced. Tightly packed core with less dampeners yields high energy from helium, lithium and other light elements fusing. Absorption of most energy by the stellar mass affects all but light waves and heat particles with large wavelength resulting in an object in the visible spectrum near the red end, producing a Red Giant. The process of helium fusion begins not as current theories project, when most or all sources of hydrogen fuel is used up. Helium is part of the process from inception of the stellar fusion reaction, growing in proportion to hydrogen fused within the compression zone as heavy elements gather and increase about the core, as central density rises. The multi-elemental fusion process proceeds with the dominant fuel, hydrogen mixing with its ash by-product helium and other heavy elements gathered at the origin of the local big bang displacing the lighter element hydrogen, which sinks or concentrates at or near the center of the core, dependant upon the churn. Would not helium and other elements displace the lighter hydrogen elements slowly as the core churned? All the while, compression would increase due to the heavier new mass sinking into the new core, creating a new self-perpetuating chain of events. Initiation of the helium fusion process begins about the small molecular random groupings helium nuclei within the concentrated core. The result is a series of random bursts of energy due to compression-fusion occurring from drifting of helium atoms placement within peak pressure zones among the many neutral to pressure voids. The problem with the creation of heavy elements is multifaceted, with the primary being natural separation between increasing due to mass and the average pressure to overcome core nuclear properties of stability. This is achieved when all sub atomic particles responsible for a new element are in place within a peak pressure zone, otherwise the resultant formation aborts and breaks down inertly or with some elements leaching particles in the form of radioactively. The peak pressure compression zones are created by the random hydrogen fusion energy pulse waves generated within the core that are within close proximity. If you can, visualize a compressed sphere where parts are dense and others light, where the viscosity of the medium turns over and sparks of hydrogen fusion when they occur are as points of light with the sphere, separated by intensity and frequency of occurrence. Waves associated with the bursts are generated from many areas, reinforce each other at specific points within the 3 dimensional spherical grid ever changing, when the pressure waves converge at a point, sufficient force is available in some cases to invoke fusion among the various trapped sub atomic particles needed to complete heavy elements. It takes the right point of confluence of reinforcing created waves of pressure to coincide at the location of available matter of various masses. So a core seemingly only capable of hydrogen and limited helium fusion continues, but allows for unusual. The fusion reaction creates a multitude of known and unknown elements in the universe, the building blocks. A general examination of these random spherical fusion bursts morph over time into the form of a hyperbolic conical elongated tube expanding towards the surface where the edges parallel to rotation are deformed in an ellipse proportion to distance from center to radii of the stellar mass and viscosity of the stellar medium, the force of gravity in conjunction to mass pressing down and torque due to rotation. If we were to reference a spherical burst under compression within the core, let us scrutinize the some primary forces on all surface aspects of the expanding bubble of energy produced from the fusion reaction. An energy-pulse bubble would create an initial repulsive force oscillating in a increasing wave amplitude format against the constrictive particle force of the core due to crowding. Thus movement of the bubble would occur towards the weakest point of pressure, the surface. As the burst accelerates towards the surface and horizontal compression laterally eases in an equation that resembles a hyperbolic curve as the deformed bubble compressed towards one end in the direction of the core and expanding outwards towards the surface. These bubble as they rise to the surface follow pre-determined paths. The reason is that the path already forged by a burst is hotter, more fluid motion and has a lower density than the surrounding stellar mass. It is well known in science that as a particle expands, it follows the path of least resistance. So the recurrence of Sun Spots in the same latitude is not a pattern or cycle, but an opportunity to expand to the stellar surface the easiest conduit with the rate of rotation limiting the upper and lower values of latitude appearance. The core of the stellar object absorbs the bursts of energy expanding slowly. The random fusion process subsides and the core cools relatively to the past capturing new pockets of hydrogen overlapped during expansion phase. Upon compression, hydrogen and fuses expanding the core slightly, but creating more heavy elements like helium. The heat created by hydrogen fusion is absorbed and expansion limited to the relative mass proportion of heavy elements to light. The core again compresses as heat leaches to the outer parts of the solar object. Helium fusion reactions initiate again due to hydrogen fusion burst pressure waves converging randomly about pockets of helium. Oscillating in an upward spiral of energy output, until the injection of hydrogen creates an imbalance. Helium used in the fusion process in not replenished. Total fusion energy is absorbed by the total mass, which eventually allows equilibrium between the outer surface shell of the solar mass and gravity to be reached far beyond the initial stellar mass radii creating a super giant of stellar mass in most cases red. Although, mankind never examined the Sun’s core and the pressure needed to initiate and sustain a helium fusion reaction. Low mass in relation to volume, high-energy expansion due to low gravitational containment all are precursors. The growth phase of the Red Giant initially self perpetuates, as expansion of the core due to excessive heat yield and greater particle pressure flow is generated from sporadic pockets of helium fusion throughout the core. Would not more energy be released in a helium fusion reaction than hydrogen? As the surface of the star expands it is subject to the same rules of physics, expansion of matter is proportional to the induced heat and reduction of gravity upon the surface. The initial pulse or burst of energy from the fusion process of helium introduces a new force that cannot be contained by the ambient gravitational field. Energy diffused throughout the stellar mass results in an increase of molecular motion, thus volume swells expanding surface to dissipate the excess energy. The force of gravity is reduced by the expansion of the mass within the core. One has to consider the affects of mass expansion within a cosmic object. The mass of a stellar object only decreases over time due to the force of out going particle flow dependent upon the fusion reaction vs. the retention, the force of gravity upon the surface tension of the solar mass. If one were to expand the volume of mass of the present Sun to a radius that would reach earth orbit, there would be a corresponding decrease of gravitational pressure emanating from its expanded core. Once expansion sets in, would not the growth of the stellar mass reduce the critical pressure to maintain a helium fusion reaction? Thus a cycle where gravity would again collapse the solar mass upon itself reducing the core diameter as compression begins. As molecular activity of the heavy elements due to heat swells the original volume to mass ratio, there is a corresponding decrease in the flow of gravity particles that occurs. This cycle of core expansion, outward push particle flow push and the reduction of gravitational containment flow, still allows internal reflective pressure waves to maintaining some of the helium fusion process until the critical point of core collapse engages naturally. Where the reflective pressure wave in some cases are not sufficient to initiate helium fusion in the absence of core compression due to expansion. 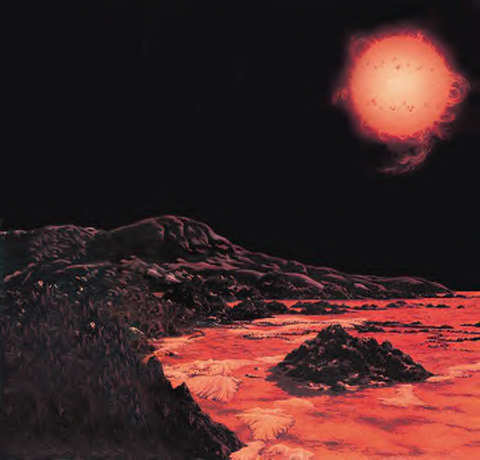 The reduced gravitational field allows a sphere many times larger than the original now glowing red as the nuclear furnace without the large compression factor burns only a small percentage of the original mass the mass remains much cooler and equilibrium of the stellar radius settles in the giant phase of stars. This oscillating cycle does have descending peaks until compression cannot initiate the remnant helium fuel where the core is basically of the same mixture. The red giant in some cases slowly pulsates as the star goes thru periodic expansion and contraction phases with the amplitude of the maximum bursts are reduced over time. The pressure at the center of a Red Giant could not sustain helium fusion or even hydrogen fusion on a sustained basis, so mankind’s explanation in its present form is suspect, but we do know Red Giants do exist. Until core collapses as the heat loss to surface is not replaced thus tipping the balance in the core towards the initiation of contraction. I'll give you a short answer and a longer one. The short answer is that towards the end of a star's life, the temperature near the core rises and this causes the size of the star to expand. This is the fate of the sun in about 5 billion years. You might want to mark your calendar! The long answer is that stars convert hydrogen to helium to produce light (and other radiation). As time progresses, the heavier helium sinks to the center of the star, with a shell of hydrogen around this helium center core. The hydrogen is depleted so it no longer generates enough energy and pressure to support the outer layers of the star. As the star collapses, the pressure and temperature rise until it is high enough for helium to fuse into carbon, i.e. helium burning begins. To radiate the energy produced by the helium burning, the star expands into a Red Giant.